Many information security decisions are made on risk management and how best to reduce risk, whilst staying profitable and not endangering user experience. A key area of focus, is the use of a common business focused language when describing risk, the benefits of reduction and the controls involved in the implication. According to James, organisations need to "reduce the gap between the business and infosec teams view of risk, and standardise on the risk management frameworks being used". 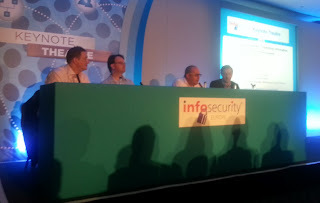 Geoff Harris from ISSA promoted the argument of better security awareness, as being a major security enabler. He described how a basic 'stick' model of making offenders of basic infosec controls, buy doughnuts for the team, worked effectively, when used to reduce things like unlocked laptops. James also pointed to "targeted and adaptive education and training" as being of great importance. Different departments, have different goals, focuses and users, all which require specific training when it comes to keeping information assets secure. All in all, the panel agreed, that better communication with regards to information security policy implementation and better gathering of business feedback when it comes to information security policy creation, are all essential.